We lost our Japanese Chin, Michi, 7 months ago on July 4th. We found him in a shelter when he was 3 and he lived for another 10 years even though his heart was poor early on. Pet stores were out of the question so I started to search the internet. I couldn't believe our good fortune when I found ChinnyChinChin. I watched the site for a while and bit the bullet last month. Dexter (Indy) arrived 3 days ago, and we are in heaven. Indy is an extremely well adjusted puppy; he feels right at home and is very happy. We are enjoying him to the fullest! Bobbie worked with me and was very patient and honest with my inquiries. This was the first time we had gotten a dog sight-unseen. I already had a good feeling watching him in videos but never imagined he would be as perfect as he is. Additionally, he made the trip from Oregon to New York with a wonderful nanny, and Indy showed no signs of distress upon arrival. I give Bobbie and ChinnyChinChin the highest rating as is possible as well as the nanny, Hubert. Thank you, Bobbie We are in love! ​​It has been over a week since Laffy Taffy came into our home. The moment I saw him on the internet I couldn't get him out of my mind. And when I showed him to my daughter, she said, "Mom you're going to regret it if you don't buy him." With that sentence, Laffy Taffy became a part of our family. However, buying a dog sight unseen was unsettling at best knowing that I would send money for a dog to a breeder that I knew nothing about other than what's on the internet. Little did I know I was in great hands. The process of buying Laffy Taffy and flying him via a pet nanny, was incredibly easy because of Bobbie. Everything went according to plan and the communication was nonstop with Bobbie and the pet nanny especially during the flights taken from Oregon to Tampa. Today, our two pound Laffy Taffy is adorable, smart and just about housebroken. He's scared of nothing and has the heart of a lion. 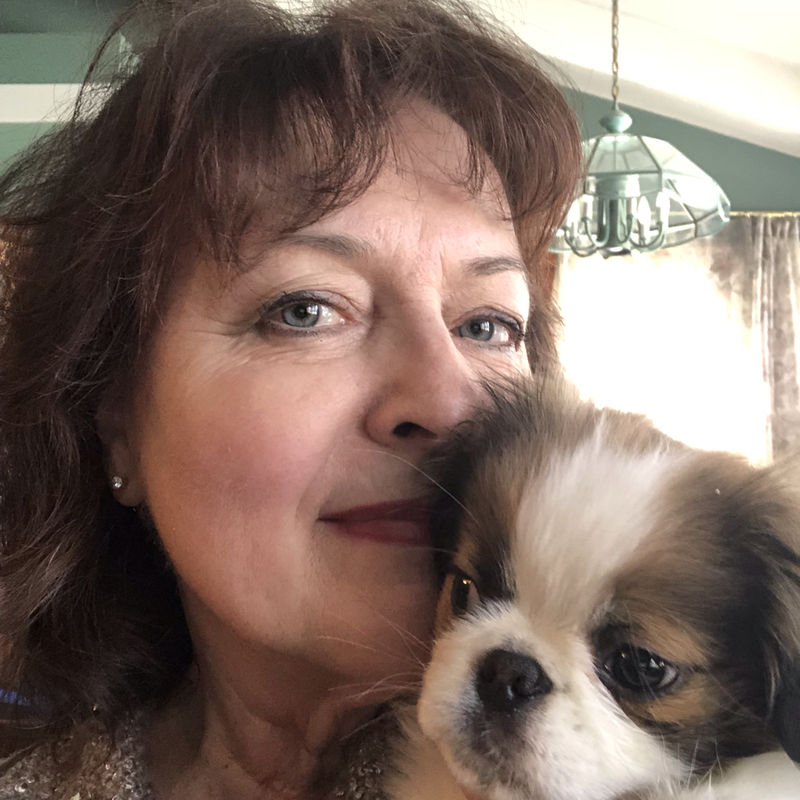 I thank Bobbie for raising such a happy, healthy and beautiful Japanese Chin that has brought us so much joy and laughter. ​I originally bought one pup (Sebastian) from Bobbie. She was easy to communicate with and always sent a picture or video when I asked. Sebastian was so sweet and to see him with his brother (smitty) we knew we just had to get both of them. The pet nanny she used was great! He keep in contact to let me know where to meet. The process went very smoothly. We’ve had the puppies for about a week. They are so sweet and smart. My family is so in love with them. I highly recommend Bobbie as she is a great breeder and very easy to deal with. I was hesitant to put down a deposit to someone I hadn’t met or knew nothing about. After I read others testimonies I decided to do it. Best decision I’ve made!!! Thank-you Bobbie! ​​I purchased a puppy from Bobbie the first part of July. Bobbie was quick to respond, easy to deal with and made purchasing a puppy from out of state easy. The puppy showed up, clean, happy, and healthy. Panda has been a real sweetheart since day one, she is outgoing and loving. You can definatly tell, Bobbie spends time with her puppies as they are well socialized and acclimated into my environment very easily. The pet nanny service she used was wonderful and professional. Thanks! ​Another story about Spunky. We have a pet 7 stroller from Chewy and are getting much enjoyment from it with Spunky. The weather was warm last Friday and we asked if we could bring Spunky into a restaurant in Newport. He was in his stroller and they were very accommodating. I told them that he doesn't bark and won't make a noise. We sat at the back with him next to me and he could watch people coming in. As we got ready to leave different ones hadn't realized there was any pet inside.. Every where we go we are always asked what breed he is. There were some workmen down the street who wanted to take him home. He gets so excited when people talk to him and he goes on little walks and has met some neighbors who have fallen for him too!! Tuesday, yesterday Stan had an appointment for a hearing test in Newport. We brought him in his stroller and did he get the attention. Two fellows were there to do the testing but before it was done, they both had to take turns holding him. When I was going to put him back in his stroller, he made a grunting noise pushing away from me. I asked if there was a restroom near by as Spunky needed to use his pee pad. They both couldn't believe this but right away he went. I love being very in tune to him and I truly believe God sent us to you that day we adopted him. He is worth every penny. ​Thank you again for meeting me at the Portland airport w/"Nikko". I am so glad the trip up & back to LAX was smooth. She transitioned so well! We look forward to many wonderful years ahead with our new little chin!! She has brought a smile to many and always causes quite a popularity commotion at the vet! 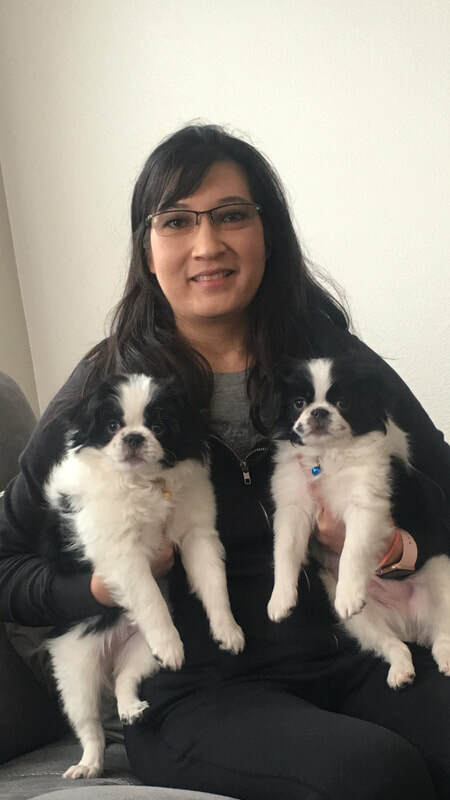 We are so thankful that we found you and are glad to have another Japanese Chin in our lives! 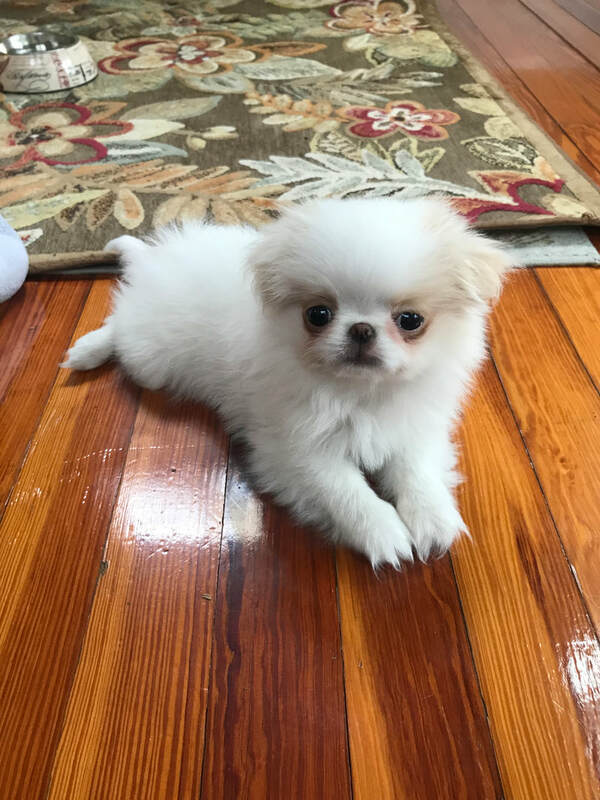 ​Bobbie raises beautiful puppies in her lovely home and helped me choose just the right little one. I recommend her enthusiastically as both a responsible breeder and great person to work with. I couldn't be happier with my healthy, happy puppy! ​I just bought a puppy from Bobbie. He is a wonderful little dog. My vet said he is in perfect health and is perfect in disposition and will be the perfect companion for me. My cat even likes him now. They play and have a good old time. I love, love, love him. I want to thank her for being the wonderful breeder she is.